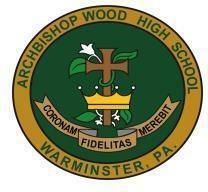 Archbishop Wood High School is committed to the safety and well-being of our students and educators. Staff members will be trained to respond to and manage tips that are submitted in coordination with state and local law enforcement officials. Student-focused training sessions will take place in school in the coming weeks. The S2SS program and curriculum is funded and managed by the Pennsylvania Attorney General’s office through a partnership with Sandy Hook Promise, a national non-profit organization working to improve school safety. The curriculum is designed to be age-appropriate and research-based.